W hen a person with eczema undergoes homeopathic treatment, the homeopath will have a clear perception of whether the case is going towards improvement or not due to the symptoms elicited from each prescription. This is called the homeopathic “direction of cure”. I think this simple piece of theory should be more generally known as it is a simple way for sufferers and parents of children with eczema to know if the child is truly benefiting from any kind of treatment they are receiving. Our body organs operate as a whole, therefore if eczema is not managed correctly, it can actually lead to deeper organs being affected and diminishing the health of the person overall. To understand this we first need to understand the significance of eczema in a more holistic manner. The skin is the biggest organ of the body. Its function is to protect us by creating a boundary between us and other organisms. It keeps water in and keeps pathogens out. A skin disease such as eczema, can be reflective of our own boundaries within our interactions with others. Have our boundaries been invaded? Sometimes in my clinic I might see a child develop eczema out of the blue when they start daycare at an extremely young age. It is possible to extrapolate that the child may feel very helpless over what is happening to it and that possibly it does not feel comfortable at daycare. Further investigation within the consultation will verify whether this is so and whether the appearance of the eczema has something to do with the child’s inability to enforce its own boundaries. Often, my adult clients may not even be aware how they are not holding firm boundaries in their own relationships, at home or amongst work colleagues and yet they are covered in eczema. Our physical barrier or skin, kindly starts to show the stress that may not be fully acknowledged in our lives. On a physical level, eczema can present itself when our body is invaded with allergens that we ingest or otherwise come into contact with. In children one of the commonest causes I see of eczema in my clinic is some form of allergy to milk, wheat or soy. Eczema can also present when the liver and elimination organs such as the kidneys are not functioning optimally and the body has no alternative but to eliminate toxins through the skin. Perhaps we have an overload of chemical toxins to begin with. What is homeopathy’s “Direction of Cure”? 1. The body tries to hold the dis-ease symptoms as far away as possible from the deeper organs of the body. No matter what the cause of eczema our body does it’s best to serve us by trying to keep the dis-ease as far away as possible from our important inner organs. It will try and limit the disease to eruptions on the skin, thereby keeping our inner organs safe. In many cases, when a person comes into my clinic with asthma, there is a good chance that they have had eczema previously and used a steroid cream at some point. The steroid cream serves to suppress the symptoms of the eczema as opposed to treating the root cause of the condition. The body can only hold out for so long against the strong steroids and then the dis-ease is driven inwards to the deeper organs that the body was trying to protect. Sometimes that presents in my clinic as no further eczema symptoms but plenty of asthma symptoms. 2. If the eczema is improving the symptoms will move down the body. After a well prescribed remedy the eczema rashes and skin symptoms should start moving down and ‘out’ of the body through the extremities. If I prescribe a remedy and the client has only previously had eczema on his arms and legs and now it is moving onto and up the torso, I have given the wrong remedy. If, however, the client’s response to the remedy is that the eczema has now disappeared from the torso but has appeared on the legs and arms, I am well satisfied that this is a positive direction of improvement. As eczema continues to improve with correct prescribing, it will continue to move down the arms and legs and out the hands and feet. At the same time all the same indicators should be there signifying a good response to a homeopathic remedy. Some of these indicators are that what is left of the eczema should be less severe, smaller or longer periods between flares. The person’s energy levels and sleep should improve and the digestive organs should function more efficiently. In the long term, I want to see some robustness in my client as they become healthier and less sensitive to allergens, if possible. Any associated illness, such as hayfever or asthma should also improve. I have treated numerous cases of eczema in my clinic. The majority have been children but I see adults also. I find children much easier to treat, personally, as they are more of a blank canvas and have not got the layers of stress and emotional experiences that an adult has built up during their lives that will impact on their eczema flares. In my clinic the vast majority of cases improve their eczema to a point where they no longer have flares regularly, if at all. I have also encountered a few difficult cases where I could not quite find the best remedy for that client. I have also seen many cases of eczema come to me where the parents have described that under other treatments the skin symptoms have moved up the body. Once these parents have the ‘direction of cure’ explained to them and they see the homeopathic remedy in action they are amazed to see it begin to work it’s way down and out the body too. A 3 month old breastfed baby presented in my clinic with red eczema spots mainly situated on the face and hairline and in the folds of her knees as well as in the crease in her groin. It is worse on the left side. It is dry and scaly. Her left eye is half shut and swollen and inflamed around it. Her left eye is weeping. The baby keeps raising her hand to it. She is a very placid and happy, sleeps well but is also alert and smiley. She loves water and is not frightened of noise or anything. She was very confident with me, smiling and allowing me to touch her and she was very pleased to see me. Her mother has become dairy free which has helped her skin be less dry and scaly but she is still having flare ups. The child had a flare up after her mother ate eggs. Analysis: The confidence that this child has indicates the remedy Phosphorus and of course it matches her physical symptoms of the eczema and the aggravation on the left side. After taking the Phosphorus 30c the client’s eye improved the next day with the swelling decreasing. 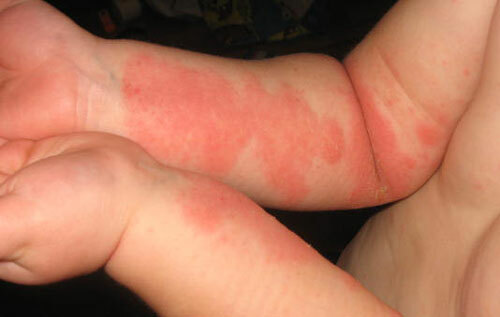 The rash is also more improved with the redness disappearing (unless the mother eats a food that she is sensitive to) and just being dry in patches. It seems to be itchy now but the eczema in the folds of her knee and groin and under her arm have disappeared leaving only a dry patch behind the knee. The dry patches of skin are now more centred on the torso and tummy rather than on the face and scalp. Baby is still sleeping through the night but teething fiercely during the day. She is still a cheerful child but cries now if picked up by anyone but her mother (new symptom). Her left eye has just started discharging a thick creamy substance in the morning upon waking. Baby has tested sensitive to dairy, nitrates and tomatoes since the last prescription. Also baby is feeding 1.5 – 2 hours at night before sleep non-stop. Baby loves bathing and loves the ocean. She has green stools. The remedy given was Natrum mur 30c. 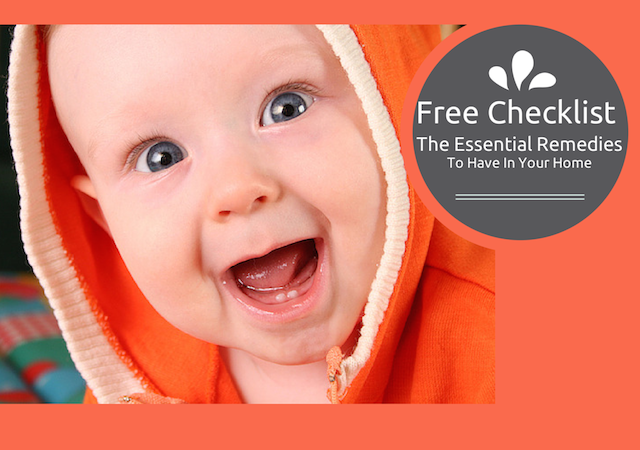 This matched both the dry itchy patches of skin and also the teething symptoms as well as the food aggravations. The remedy Nat mur loves being by the sea. It’s also interesting that Nat mur (salt) is a component of breastmilk as is the mineral Phosphorus. It is interesting that under the stress of teething she has had an old symptom come back with the left eye being irritated. Nat mur as a remedy has a strong affinity for the digestive system and this is what we are trying to strengthen so that she is not so sensitive. The child is very, very well. The skin has cleared up and the mother can eat tomatoes and nitrates now and the baby does not react to these substances any longer. Her eczema disappeared from her torso, flared briefly on her elbow and knee creases and then disappeared all together. Teething is fairly easy and the only thing that is left is occasionally she will get a watery eye. Please consult your local homeopath if you have eczema. It is a chronic condition and easily flared up with mis-prescribed remedies but can respond quickly to well prescribed homeopathic prescriptions, improving overall health and keeping the inner organs strong.